It’s no surprise that some of the most effective works of the Beatnik generation were born in the scuzzy halls of jazz bars; soaked with whiskey induced grammar, intoxicated with muddled philosophies, their pages bathed in the permanent smell of tobacco. Much like the work of Lewis Carroll, drugs, alcohol, and culture were catalysts towards the ideology of destroying the old and building the new. The movement itself was a rousing feat with great cultural ramifications. The film itself is a work that sometimes trades in the grainy for flashy; rupturing not only the pattern that the authors were trying to break, but the whole tone of the film as well. If I pitched you a story about the Beat generation led by Harry Potter, the new Harry Osborne, a guy from X-Men and the guy from Boardwalk Empire with half his face missing, I’m sure the reaction would be pretty great. Unfortunately for audiences, the subject matter submits to a truly unauthentic, lack lustre festival formula and abandons creativeness and a unique vision for a familiar narrative that disregards great historical figures, making them caricatures within a lame murder/mystery genre film. Daniel Radcliffe plays Allen Ginsberg, one of the most famous and recognizable poets in the American culture. Radcliffe continues to shed his ‘Hogwarts alumni’ image by taking risky, unconventional and edgy roles that all share in their seemingly controversial nature. Upon his acceptance and arrival into Columbia University, Ginsberg is in search of something offbeat. Ironically enough, Ginsberg is lured into the residency of Lucien Carr (Dane DeHaan), an intoxicated sociopath with an obsession for self-destruction, always curious for the taste of the complicated and unexplainable. Together, Carr and Ginsberg start a small revolution in their heads, but without so many words. With the help of an unlimited supply of cannabis and some Johnny Walker, the two eventually enlist of the help of William Burroughs (Ben Foster) and a young Jack Kerouac (Jack Huston) and begin their uprising. Through constant disruptions by the reputation and prestige Columbia University holds so true and dear to its heart, the constantly stoned literary bandits are engulfed into a world of lovers, obsession and murder, intent on revolutionizing literature. Kill Your Darlings starts bold and overwhelming, demanding utmost attention. Unfortunately, once attention is given, the film cannot hold its grip and deliver a rousing, culturally relevant story about some of the most influential figures in contemporary literature in the last century. Blending the lines of drug induced fantasy and reality, Kill Your Darlings is a story of breaking the formulaic path, distrusting all conventional and predictable beats of rhyme and meter, but sadly becomes a textbook festival entry with a forgettable conclusion. The term to ‘kill your darlings’ is one that suggests destroying all the conventions and comforts of the mundane, reinventing yourself, and throwing inhibition to the wind and finding creativity will inspire instances of utter uniqueness. Kill Your Darlings, although sometimes confident, is an obsessive and complicated re-telling of enigmatic characters placed in a deceitful and overdramatized tragedy of murder. With the rich historical and cultural imprint of these feisty literary pioneers, so much of the busy murder antics is clearly overshadowing the brilliant opportunity to showcase the likes of Carr, Ginsberg, Burroughs and Kerouac. Mixing the potential monologue moments of Weir‘s 1989 Dead Poets Society with the tone and ambiance of Salle‘s 2004 masterpiece The Motorcycle Diaries, Kill Your Darlings becomes a self-inflicted suicide of a film with a tantalizing and promising narrative. Don’t get me wrong, the performances are top notch; DeHaan is magnificent as Carr and Radcliffe is radiant as Ginsberg. However, while most of the top-billed cast is ravishing, and supporting cast is spot on, the film feels drowned in the water with average narrative cliches weighing it down. While the antics of the underbelly of the New York Greenwich Village scene have been explored, battered, bruised and forever changed by the provocative and decadent Beat Movement, Kill Your Darlings remains a tame snippet of the life of these amazing authors and thinkers. Destined to be an example of a complicated festival biography attempt, the film will positively spark deep discussion. 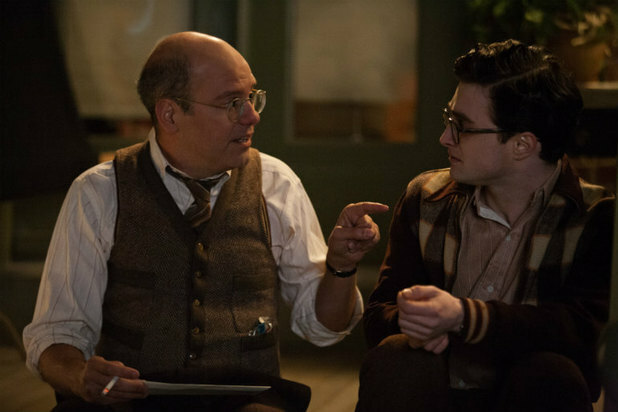 Kill Your Darlings repeats the initial reaction to Carr’s response to Ginsberg’s complicated life, “Perfect. I love complicated.” Hopefully next time, an autobiographical cinematic take on the origins of the Beat Generation will be less gimmicky and more focused on the howling affect these fascinating individuals had on the world of literature, art, and our contemporary culture as a whole. Night Film Reviews: 6/10 Stars. Killer indie darling or complete mess? 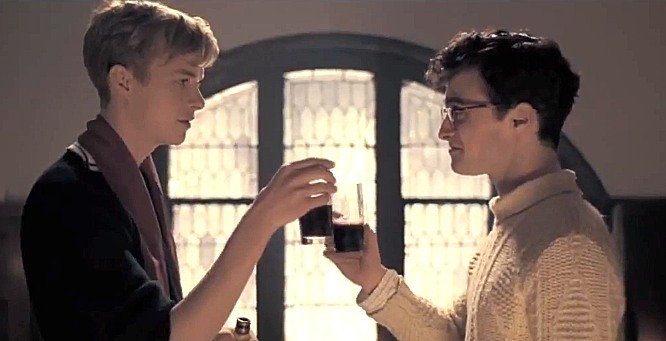 Was Kill Your Darlings a complete misfire? Leave your comments below and let us know what you thought of the film. This entry was posted in Reviews and tagged Ben Foster, Dane DeHaan, Daniel Radcliffe, David Cross, Elisabeth Olsen, Kill Your Darlings, Michael C. Hall, Night Film Reviews, Reviews. Bookmark the permalink.